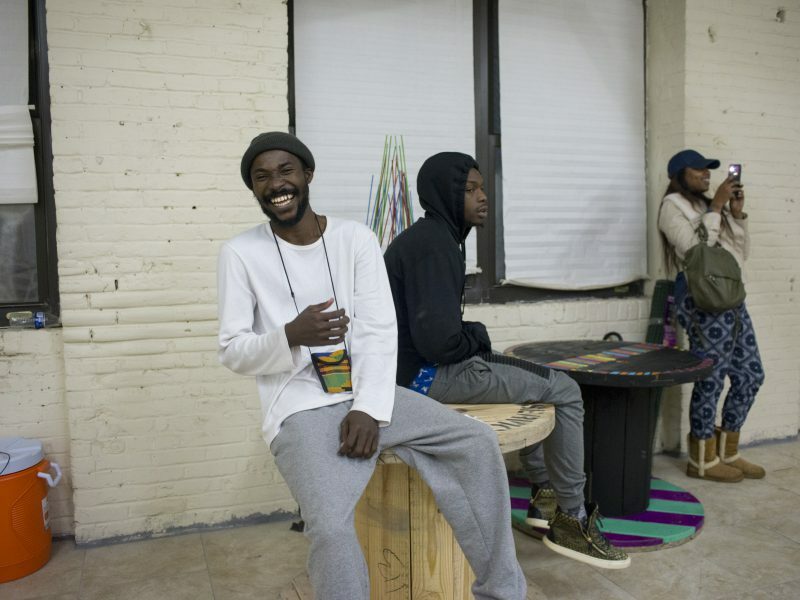 Ghanaian artist Kwasi Ohene-Ayeh fostered a collective of young artists from North Philadelphia to spark creativity and relationships. Kwasi Ohene-Ayeh is a conceptual artist and writer from Accra, Ghana. 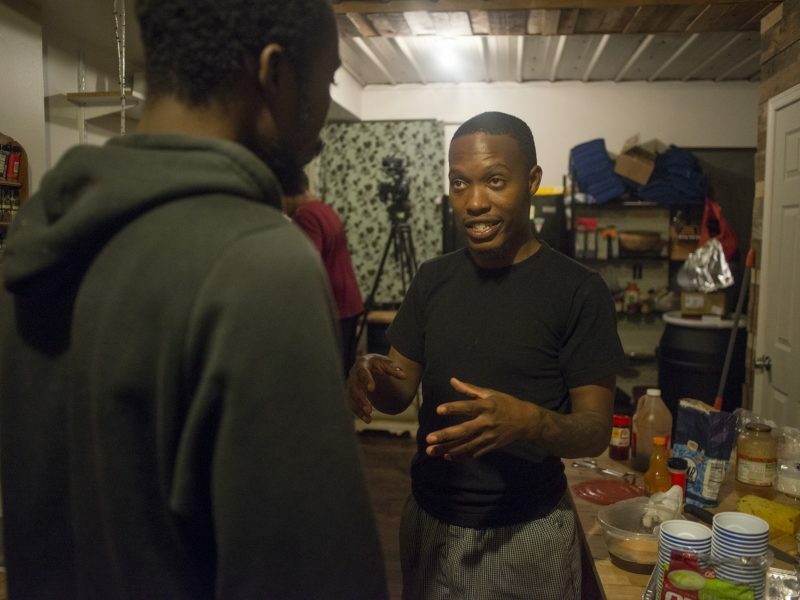 When Kwasi arrived in our neighborhood, he was struck by the number of community members with unique artistic and creative practices, from step dance to sewing, photography to songwriting. 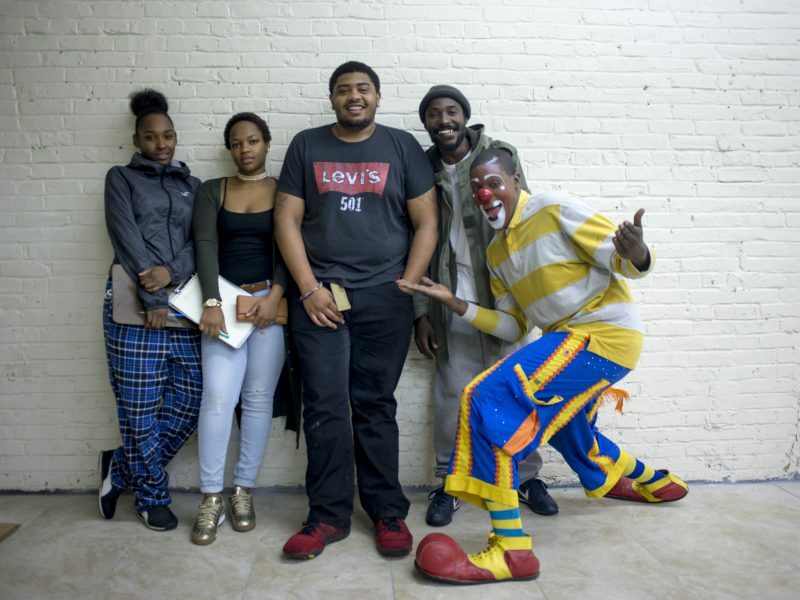 Kwasi fostered a team of young neighborhood artists — entertainer Jaquan Fields (Quany the Clown), videographer Aaron Sawyer, visual artist Tiyanna Scott and singer Tamia Garcia. 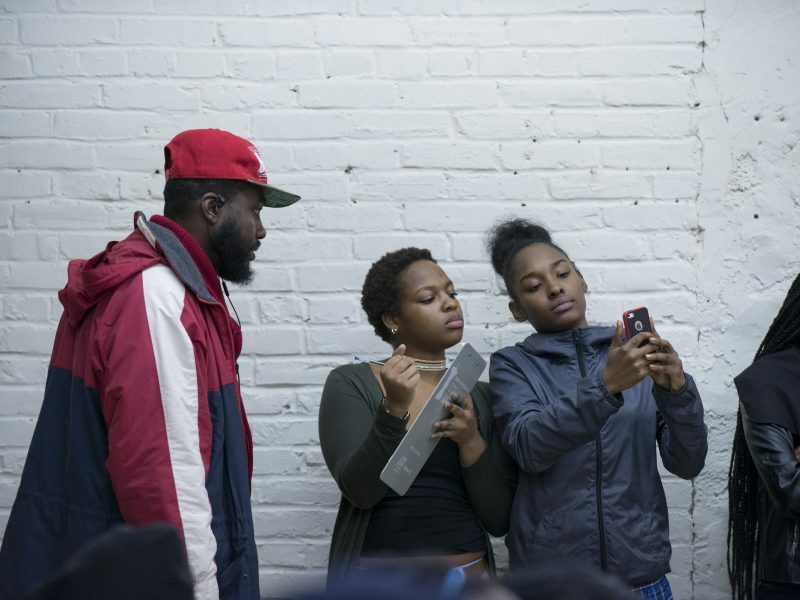 Together they originated three “relational strategies” designed to spark inspiration and connection between local creatives. Monthly Open Mic in Ile Ife Park (last Thursday of the month). Open to artists citywide, the event showcased local talent and fostered new creative connections. 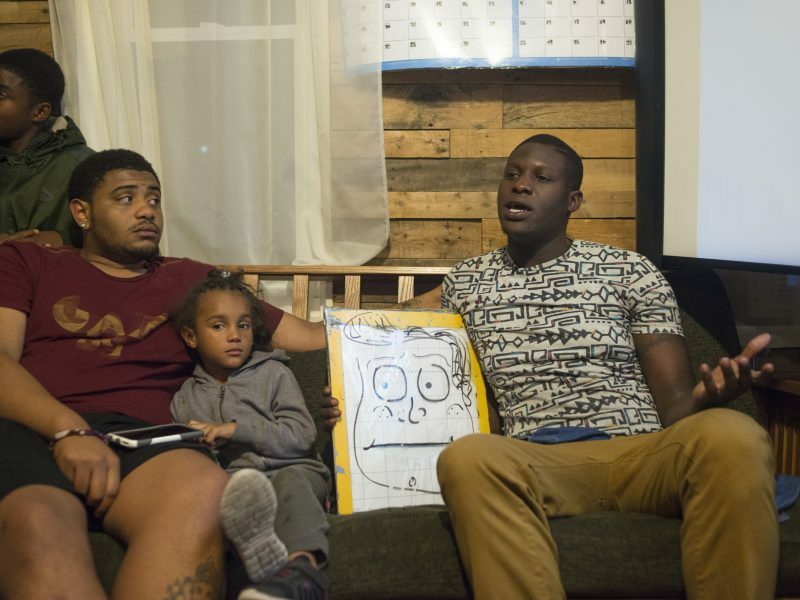 Every Monday, Wednesday and Friday, neighbors could come create with Kwasi, Quan and Aaron, and bring any creative practice or piece of art for remixing and connection. 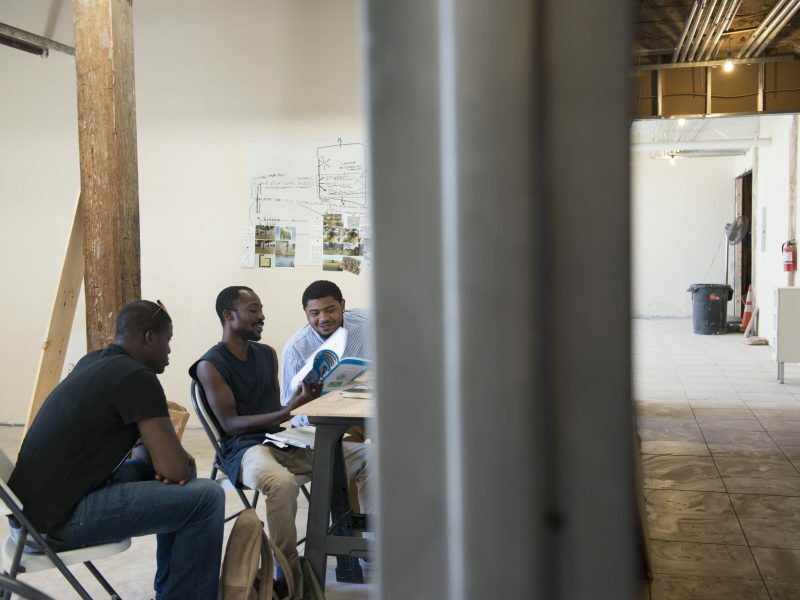 Kwasi invites local artists to discuss their practice at a series of conversations and performances hosted at his residency. 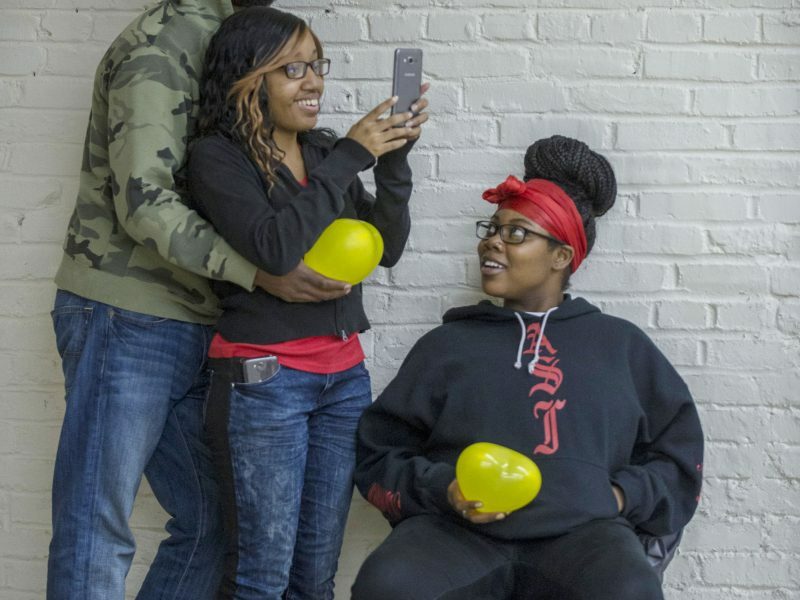 Their culminating interactive exhibition melded artwork with the moments created and shared during the residency for the audience to experience, play with, and create with. 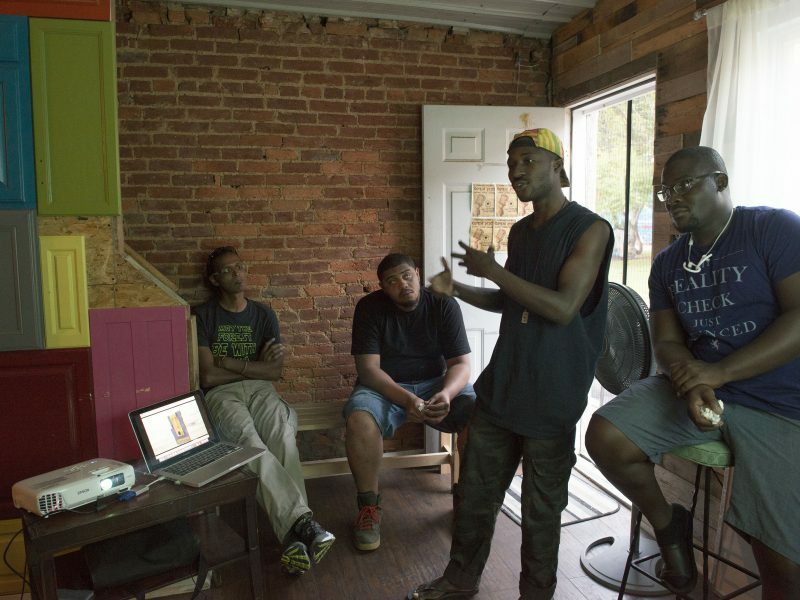 Kwasi Ohene-Ayeh sits with neighbors and attendees for Jaquan’s artist talk in Kwasi’s residence. Photo by Lori Waselchuk. 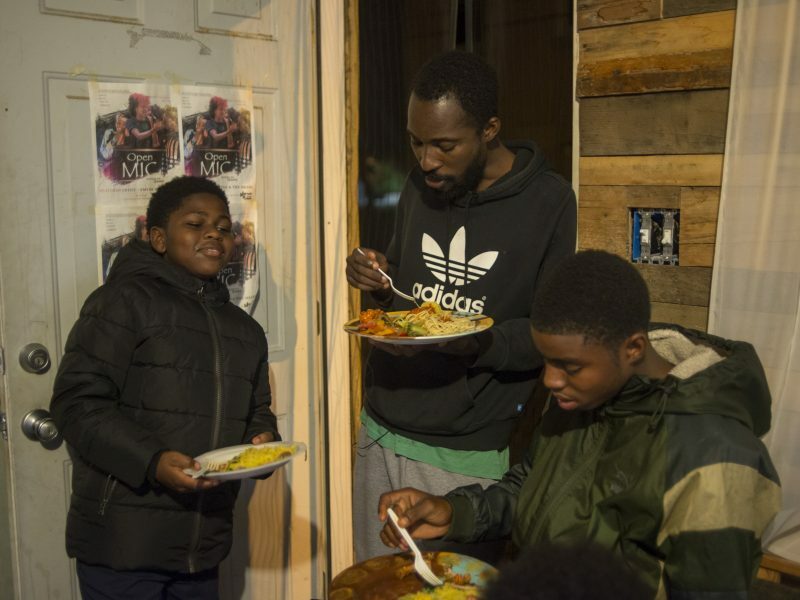 Kwasi Ohene-Ayeh eats and chats with some of the neighborhood kids who attended Jaquan’s artist talk in Kwasi’s residence. Photo by Lori Waselchuk. 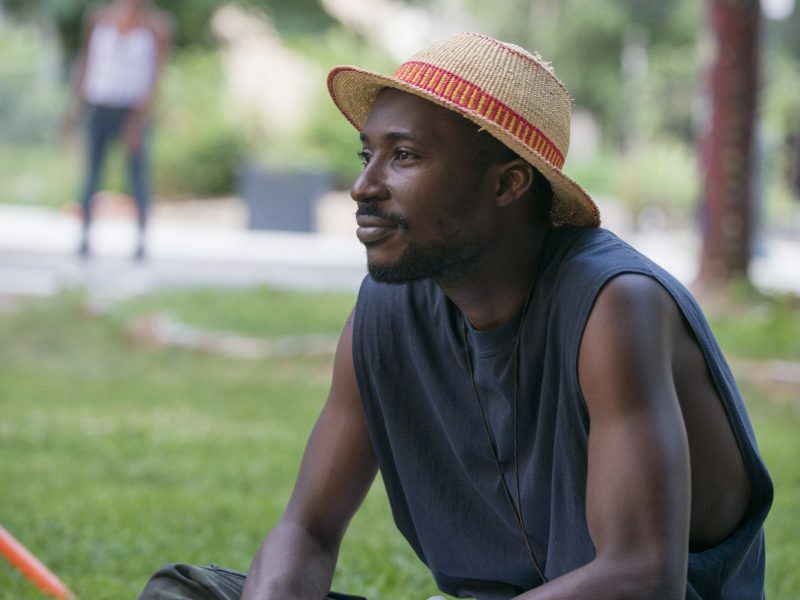 A portrait of Kwasi Ohene-Ayeh’s hat! 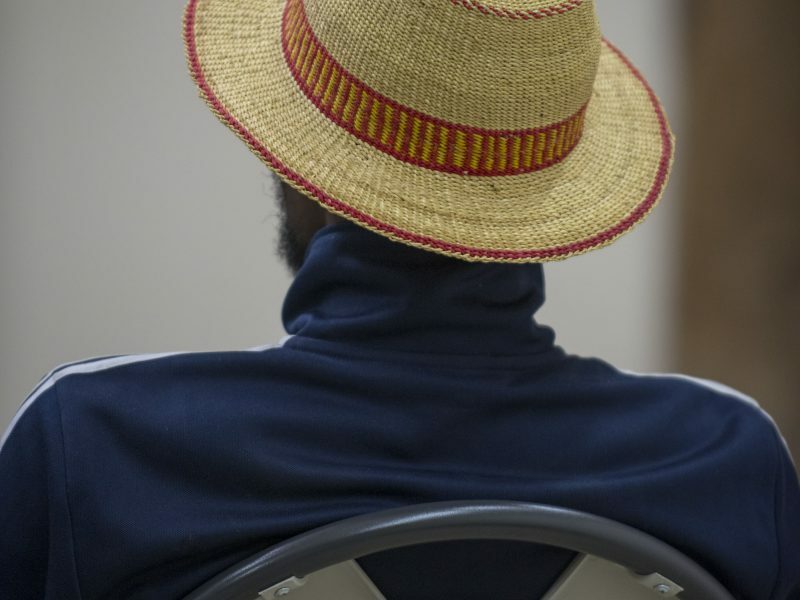 Kwasi's signature hat has become well-known around the neighborhood. Photo by Lori Waselchuk. 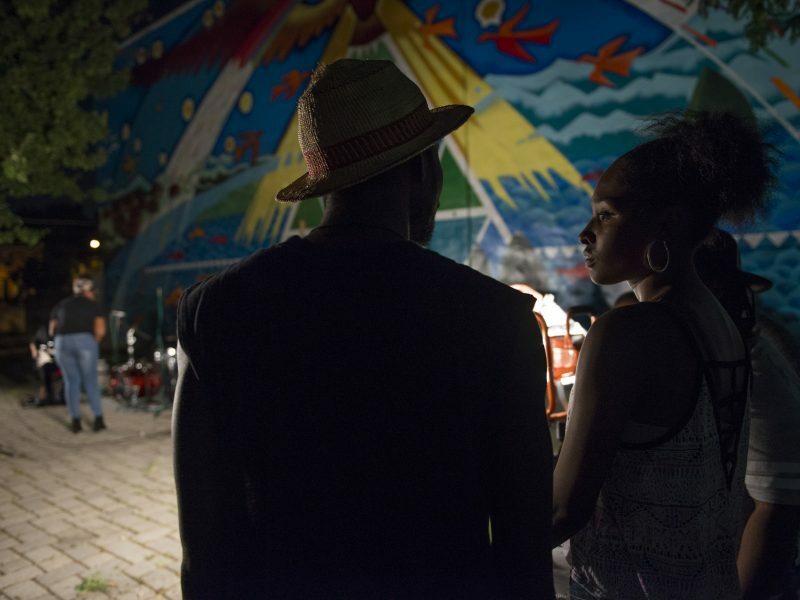 Kwasi Ohene-Ayeh documented the performers at September’s Open mic. His documentation of the process is being incorporated into the final studio exhibit. Photo by Lori Waselchuk. 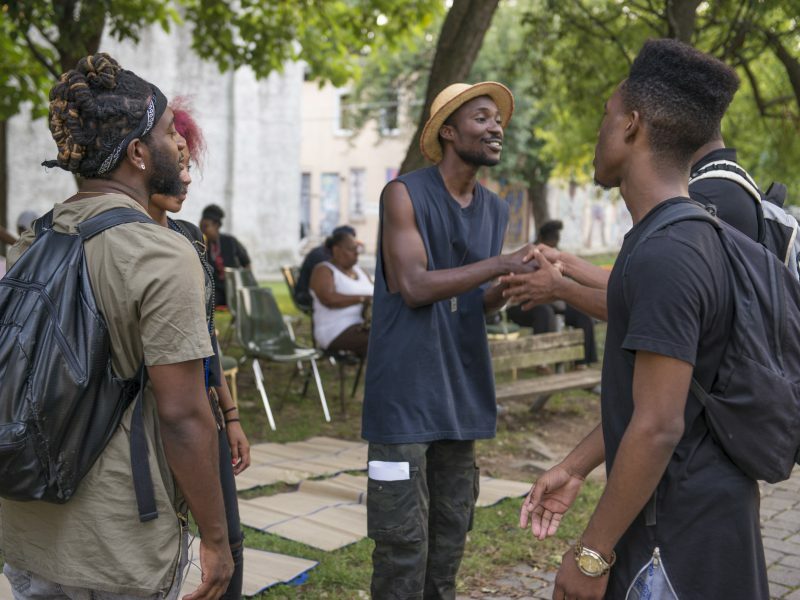 Kwasi Ohene-Ayeh greets people who came out to the August Open Mic. Photo by Lori Waselchuk. 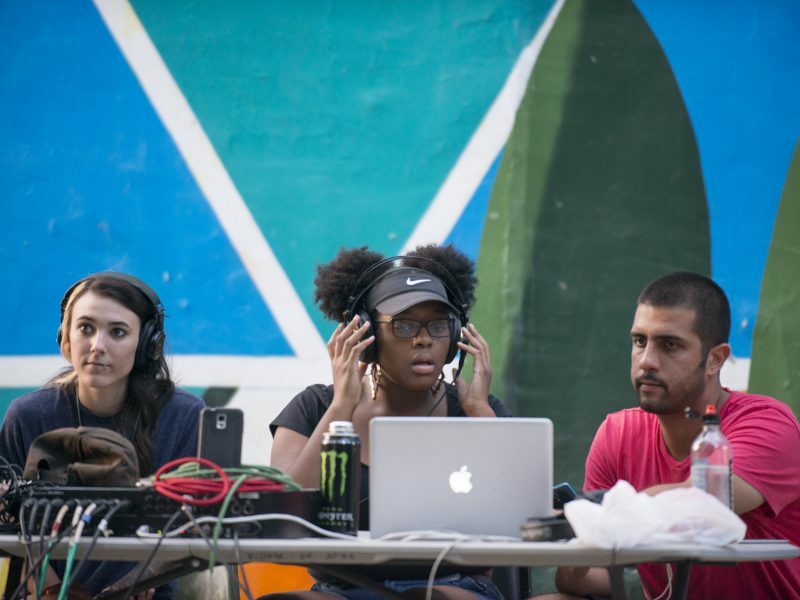 My process-oriented project at The Village explores methods of building social interactions through relational procedures grouped into two categories — open mic and 2512 sessions. ‘2512 sessions’ is a monthly series of discursive meetings which brings together creative minds in the spirit of exchanging ideas and sharing experiences. 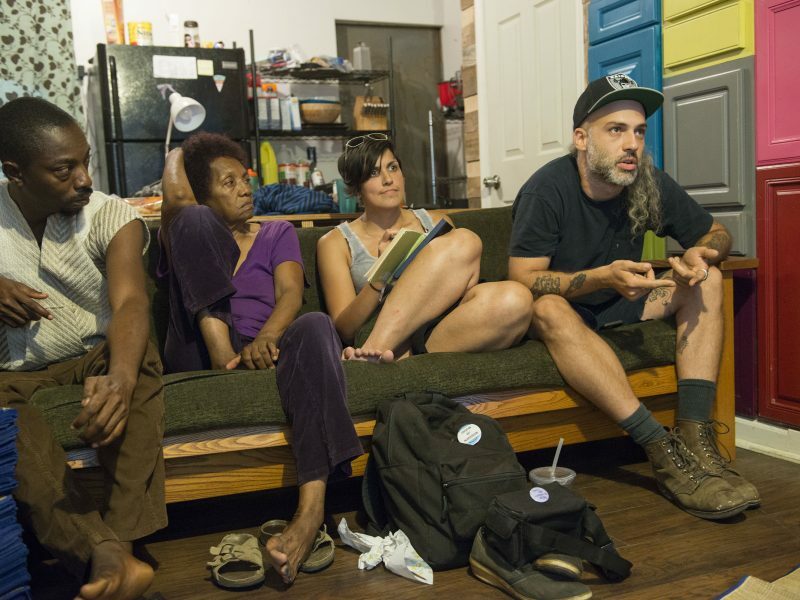 Invited participants — artists, entertainers, designers, etc — give talks, presentations or demonstrations on or about their practice at my residence in North Central Philadelphia. 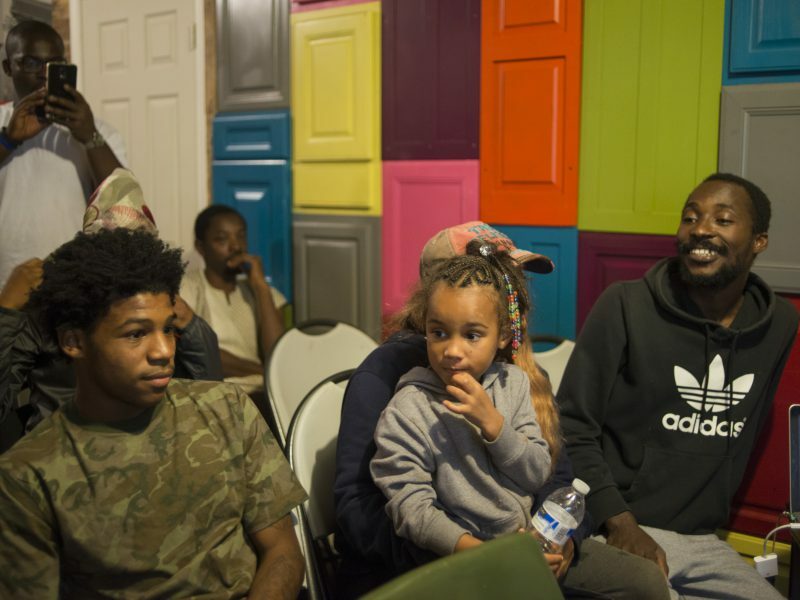 The open mic series is a monthly event created with the ethos of fostering communality through music, comedy, dance and poetry while exploring the potentials for collaboration amongst its diverse participants mainly from the Fairhill Hartranft community in North Central Philadelphia. Moments from these events are documented through video, sound and photography and are then set up in the studio which functions as a postproduction site — where a collective comprising of myself and four other local artists (Aaron, Tiyanna, Quan, and Tamia) manipulate the materials accumulated from the live events through the aforementioned mediums. In this way, the studio becomes the space which maps out the implicit connections (literal and conceptual) between the ideas, processes and locations which are or have been relevant to the project. It also becomes a temporary “exhibition” and collaboration site where members of the community may come in and intervene in our process either by taking down a photograph from the walls in the studio, or by actively working with us in their own capacity to develop ideas through video, photography, graphic design, etc. Did you make a splash at The Village Open Mic? You can download photos and videos from our open Dropbox. 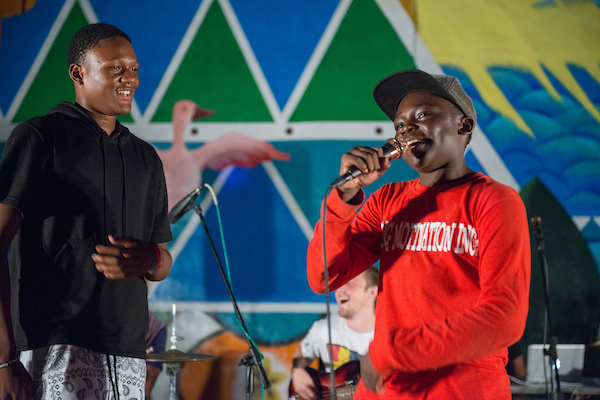 Kwasi Ohene-Ayeh began hosting and organizing monthly Open Mic events at The Village in July. 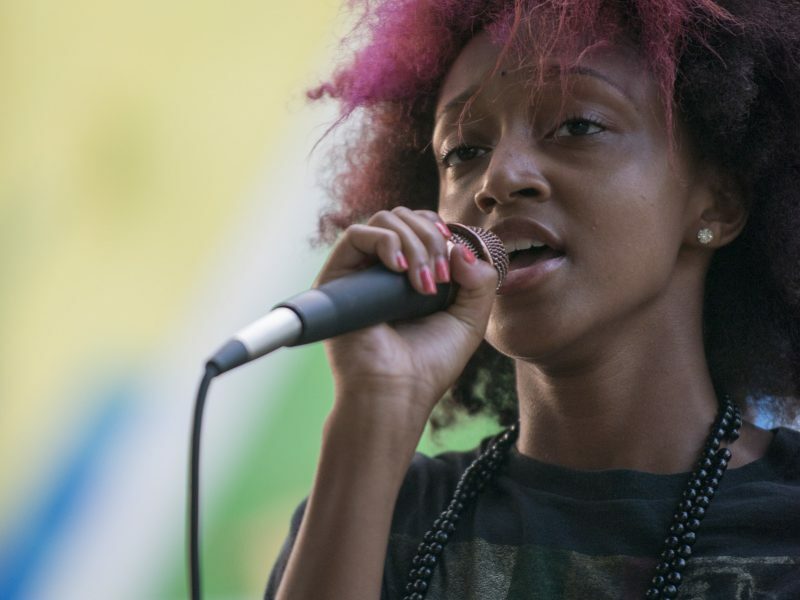 The musicians, dancers, singers and rappers, diverse in age, sign up for their turn at the mic. The audience members are friends, parents, neighbors and waiting performers, supporting and discovering each other. The energy is relaxed and welcoming. 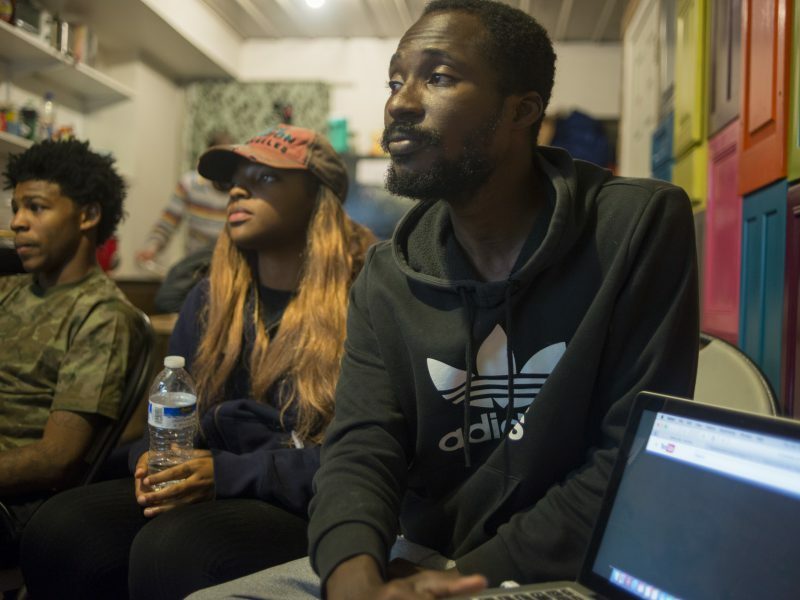 At each event, Kwasi and the artists scout potential features for future open mics. 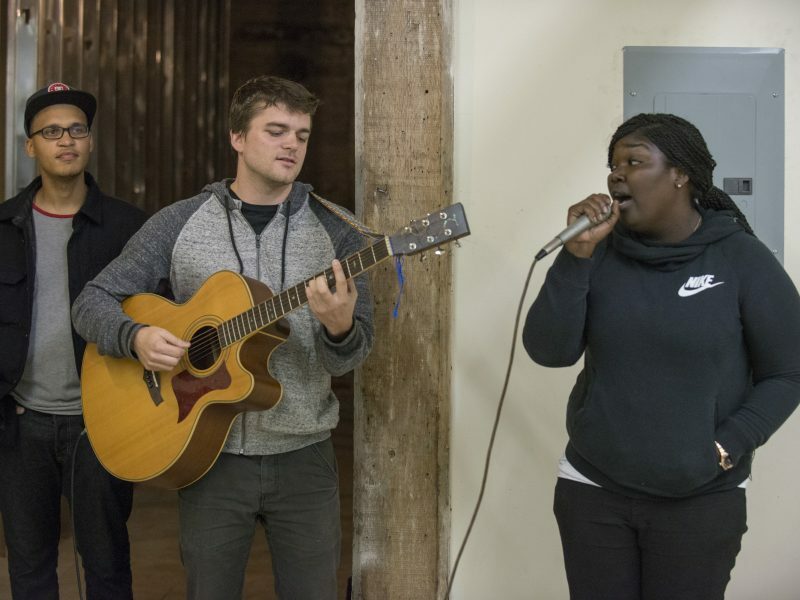 Emyne, featured here, is a student in the Village youth program, performed at several open mics and was invited to feature at October's event. Local studio Marsten House provides sound recording and engineering for each event. 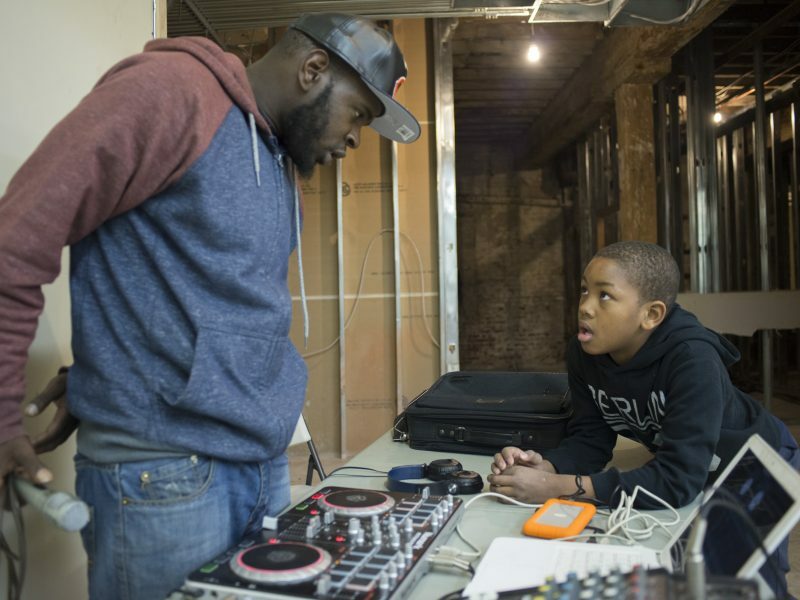 It's a learning process for Marsten House as well — they bring their interns to apprentice as sound engineers and practice new techniques at each open mic. Friends often arrive together to perform, pushing each other to new creative heights. Creative collaborations have been spurred by artists meeting one another at the event. 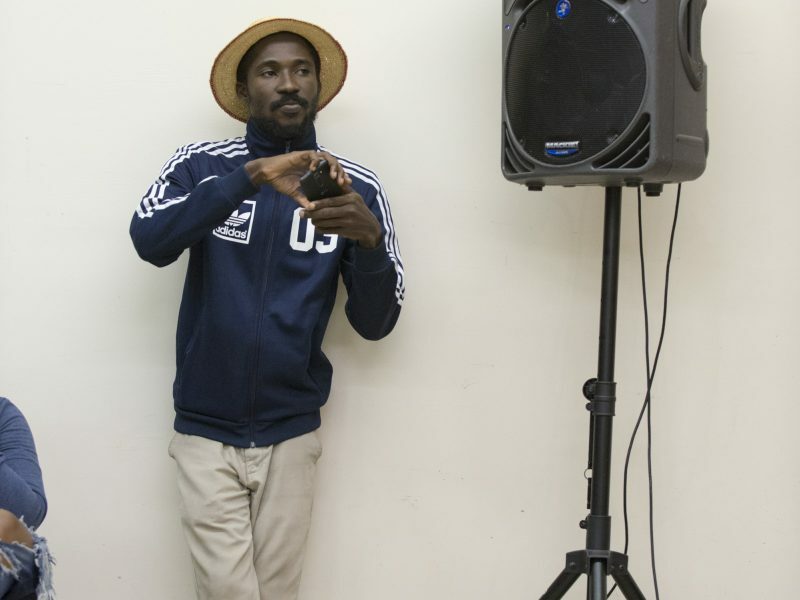 Reggie Maxton, also known as Incredible Buck, was a member of the Playback Radio project with King Britt (SPACES Cycle 1) and performed at the November open mic. 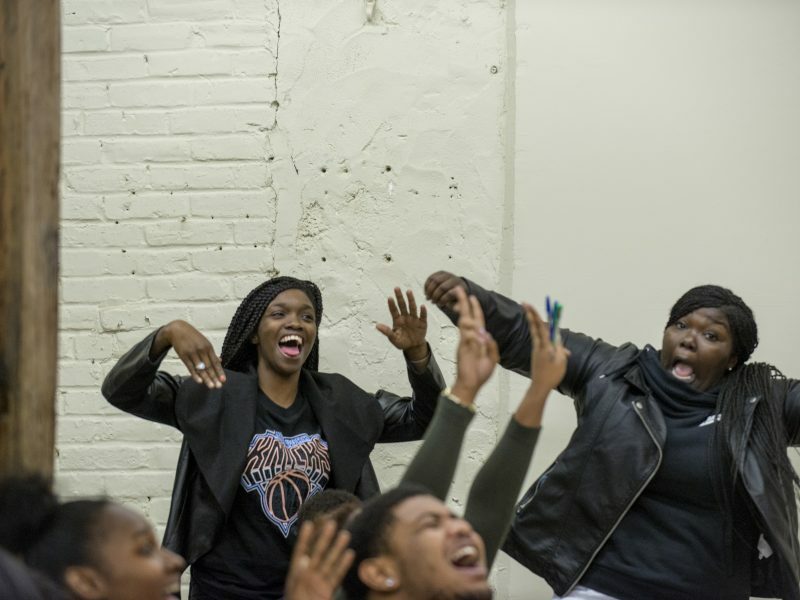 The audience is just as important as the performers -- audience participation often spills onto stage. The strumming, thumping, buzzing, full-body melodies of live music offer an essential spark to each event. 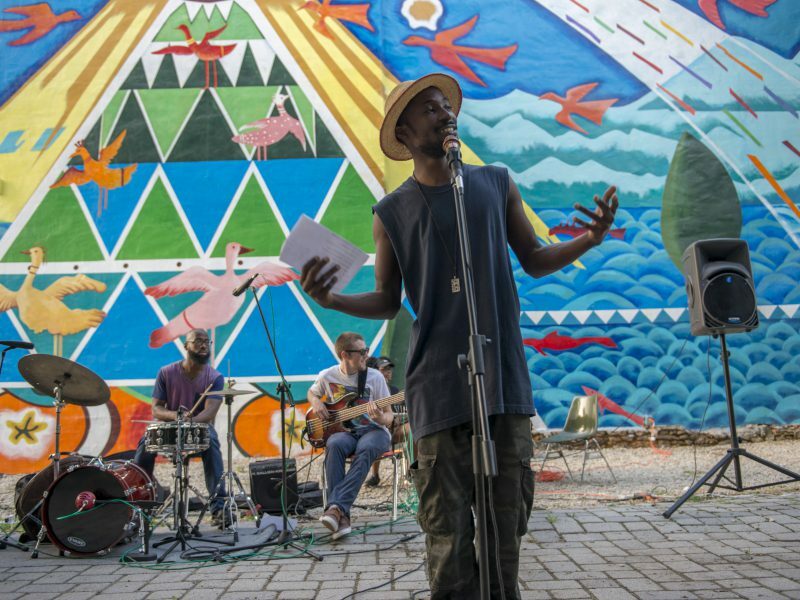 Kwasi has hosted Los Rumberos, the Urban Shamans, teachers at the Village, and other indie musicians, each offering performances and serving as the "house band" for the open mic. 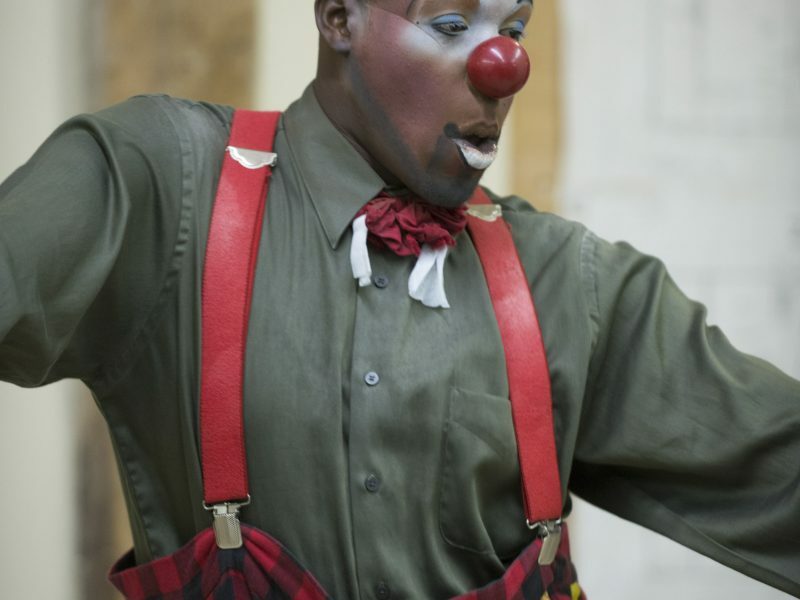 When Jaquan Fields, also known as Quany The Clown, joined the team, he soon began hosting the event. He fuses humor and circus arts with self-assured silliness, and brings the whole crowd into the energy of the night. You can find users images and video of the events with the hashtag #villageopenmic or look in the Dropbox link on our project page for all our project photo and video. 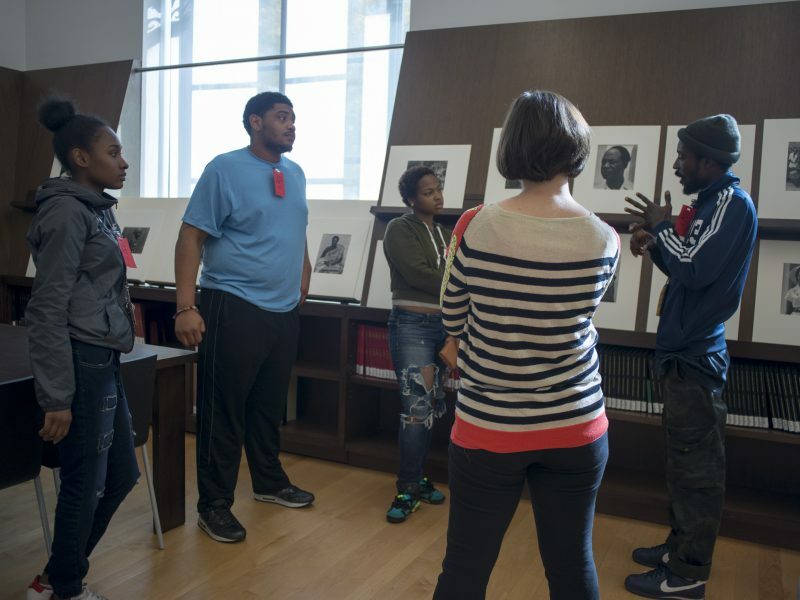 An artist talk doesn’t have to be stuffy. It can happen in a living room, while you eat the best spaghetti you’ve ever tasted. An artist talk doesn’t have to be given by a famous artist at a podium. Instead, it can be the person you’ve known your whole life, describing what makes them passionate in depth. 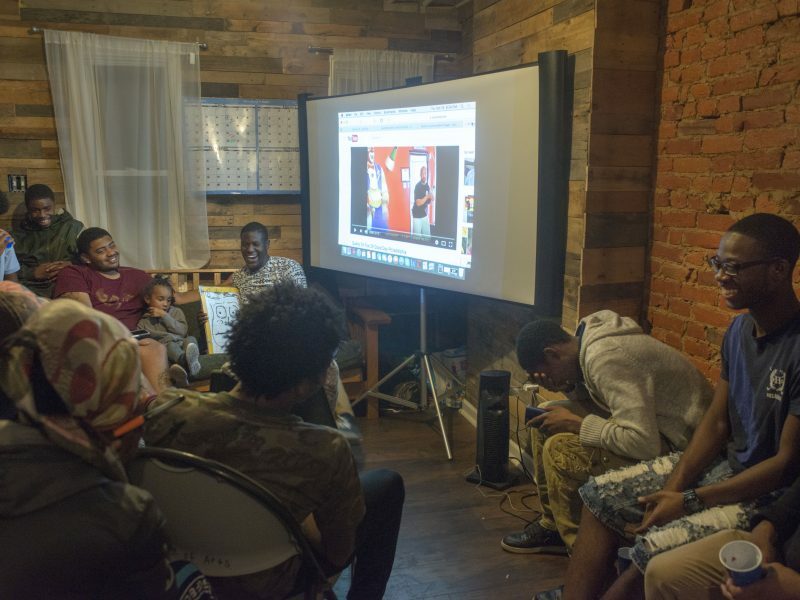 Kwasi Ohene-Ayeh welcomes those attending a film screening in August at his apartment in The Village of Arts and Humanities. 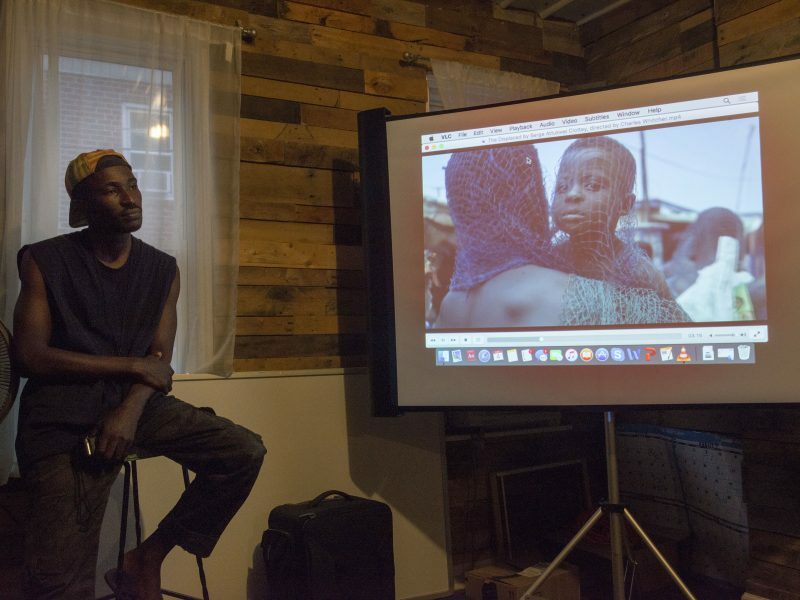 Ohene-Ayeh showed a film by a Ghanaian filmmaker which was followed by a discussion. Kwasi Ohene-Ayeh listens to the discussion that followed the screening of a film by a Ghanaian filmmaker. The atmosphere at the 2512 Sessions were informal and thoughtful. 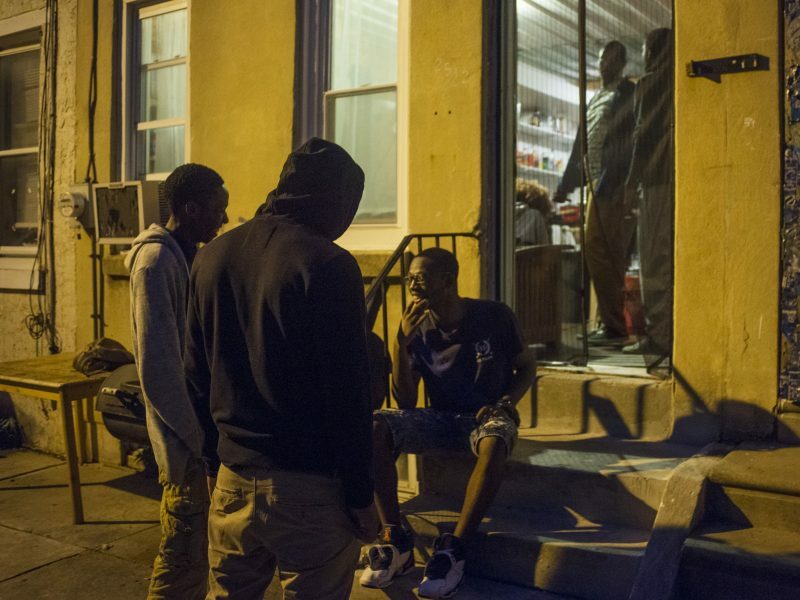 Friends sit on the front steps of Kwasi’s residence before Jaquan Field’s artist talk in October. 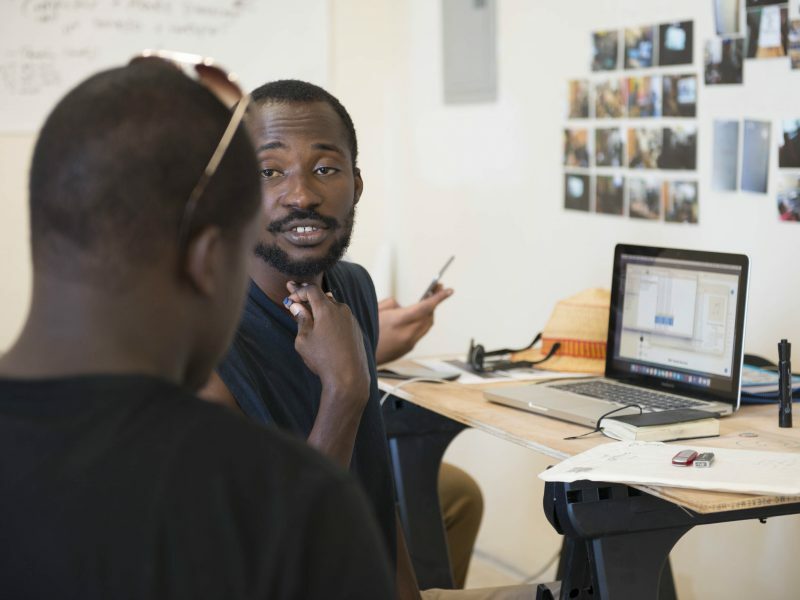 Kwasi Ohene-Ayeh hosted the 2512 Sessions, a monthly series of discursive meetings which brings together creative minds in the spirit of exchanging ideas and sharing experiences. 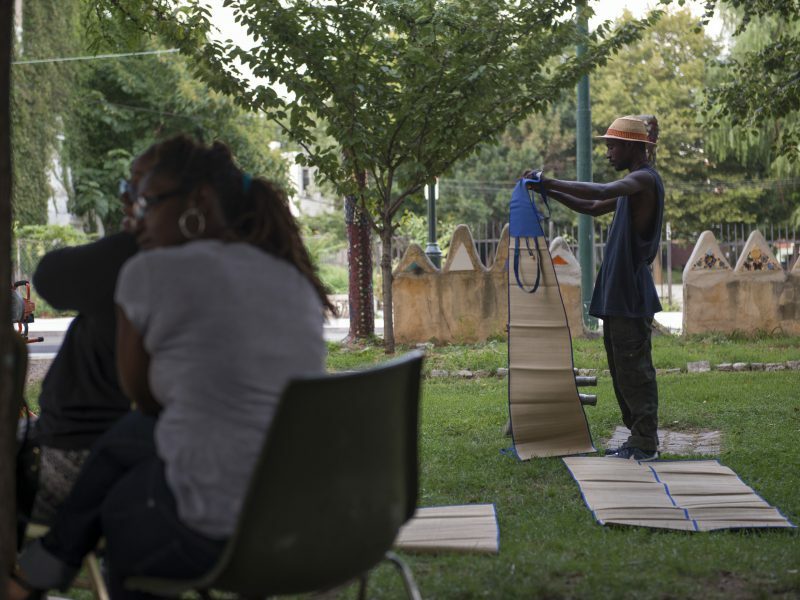 Invited participants — artists, entertainers, designers, etc — give talks, presentations or demonstrations on or about their practice at the artist’s residence in North Central Philadelphia. The atmosphere at the 2512 Sessions was open and communal. Dinner precedes the presentation, giving people the chance to socialize and share a meal. Tamia Garcia helps a youngster with her plate. Kwasi chats with boys who came to hear Jaquan Fields talk about his career as an entertainer. 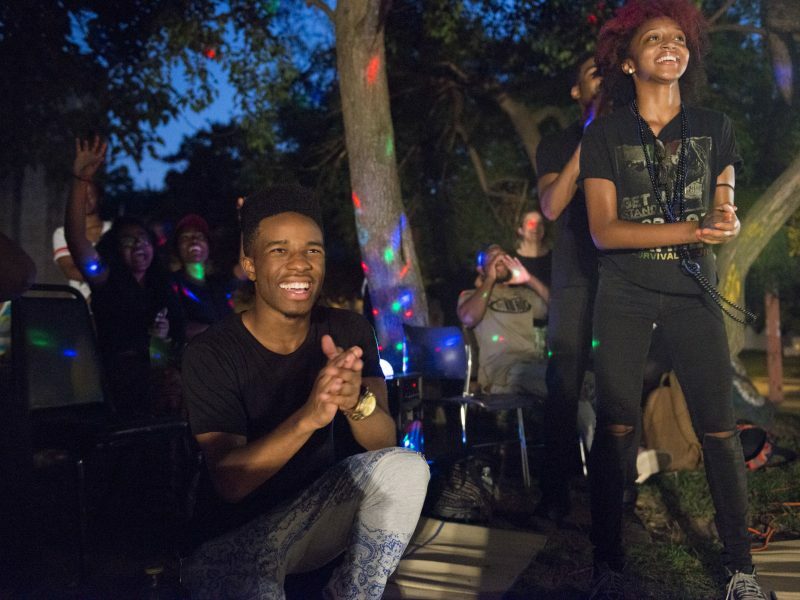 Jaquan interacts directly with his audience to demonstrates how he can connect with people during a performance. Kwasi runs the slide presentation for Jaquan’s presentation. 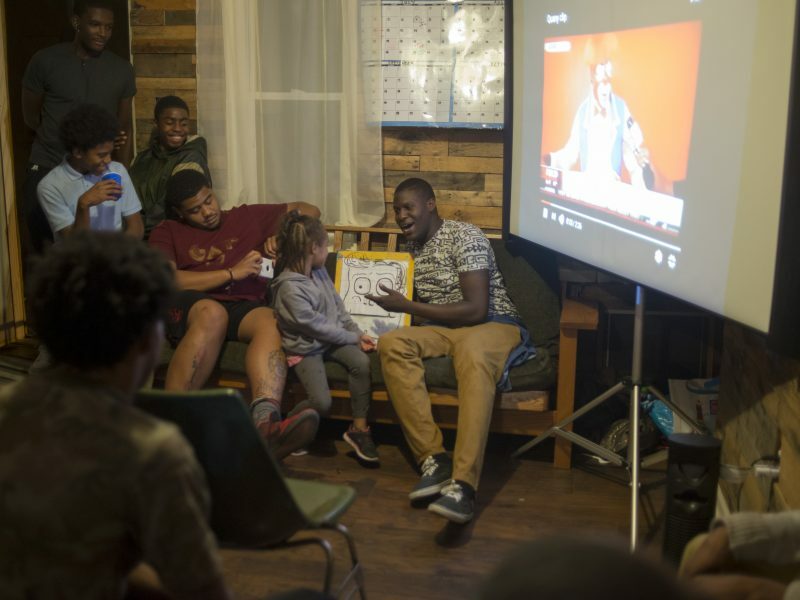 Jaquan Fields had his audience in stitches during his talk in October. Kwasi Ohene-Ayeh is a conceptual artist and writer from Accra, Ghana. Aaron Sawyer is an emerging videographer working with Kwasi Ohene-Ayeh. 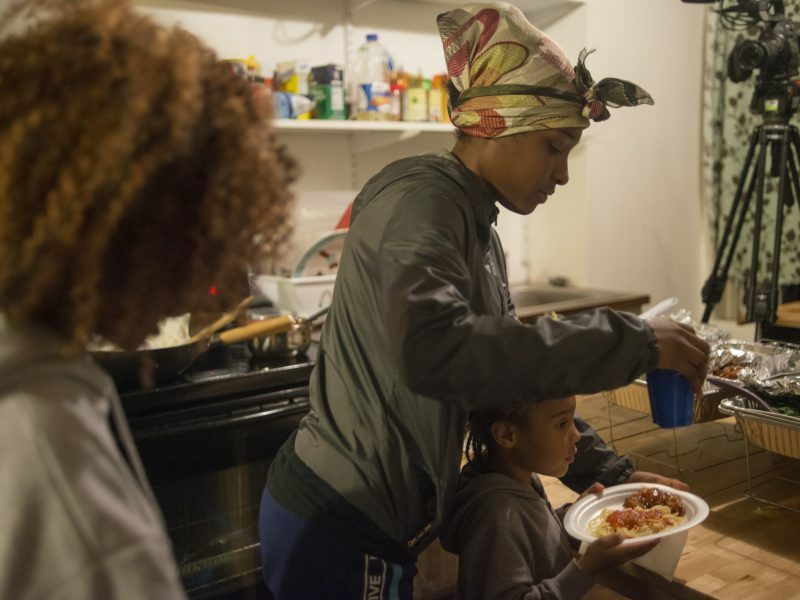 Tamia Garcia is a singer and songwriter living in North Philadelphia. Tiyanna Scott is an 18 year old artist born in Georgia and raised in Delaware, USA. Thank you to our supporters for making SPACES possible. Major support for SPACES International AIR provided by the Pew Center for Arts and Heritage.